Herman the bear and Henry the raccoon are best friends. They love playing together. Then one day Henry moves a long way away, and Henry and Herman promise each other they will stay in touch. Henry’s little fold-out letters to Herman are important to Herman, sharing what he’s doing as he settles into his new home and makes new friends. Young children are sure to love opening and reading them, too. Unfortunately, hearing about Henry’s new friends makes Herman jealous. Herman misses Henry and tries to find things to do to keep himself busy. One day when Herman decides to finally send Henry a letter himself, he finds the post office closed for the winter. He has a wonderful idea though - he’ll deliver the letter personally! That leads to a big adventure cross-country and a big surprise for Henry. 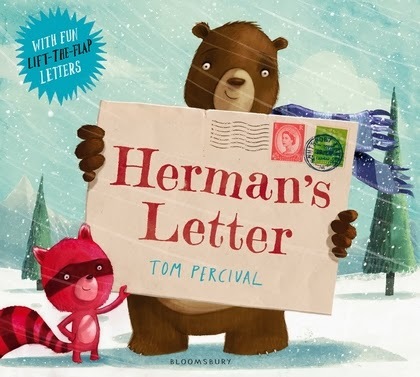 Herman’s Letter is a story that will appeal to both younger and slightly older children. I loved the cute and colourful illustrations, and the simple and realistic explanation of how you don’t have to lose friends just because they are somewhere else. Watch author and illustrator Tom Percival drawing Herman and Henry here and a trailer for the story here.